Having its origins in the F-5 Tiger the Super Hornet is described by Wikipedia as a twin engined carrier-capable multirole fighter aircraft. 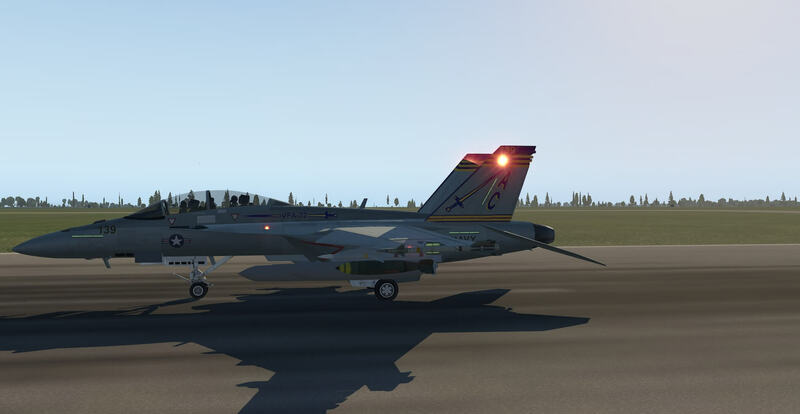 The FA-18F is a tandem seat version of the aircraft. It has an internal 20mm M61 rotary cannon and carries external stores as well as external tanks for extra fuel. The McDonnell Douglas Super Hornet first flew in 1995 with production starting in 1997 and increasing to full rate production by September 1997 a month after the merger with Boeing. The Super Hornet entered service in 1999. 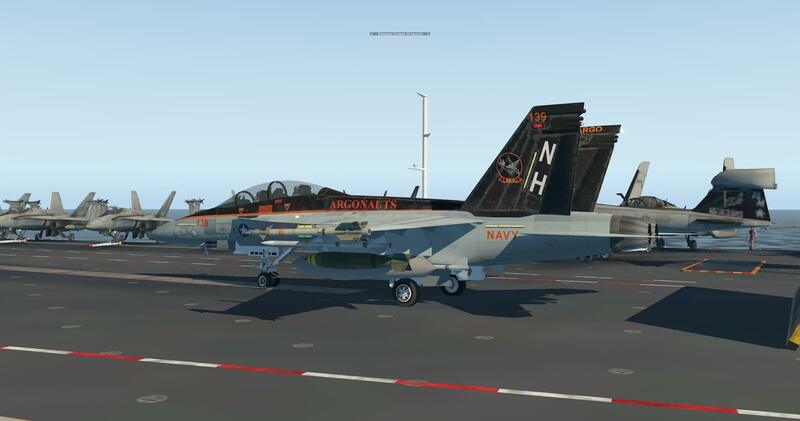 The primary users of the aircraft are the United States Navy and the Royal Australian Air Force. 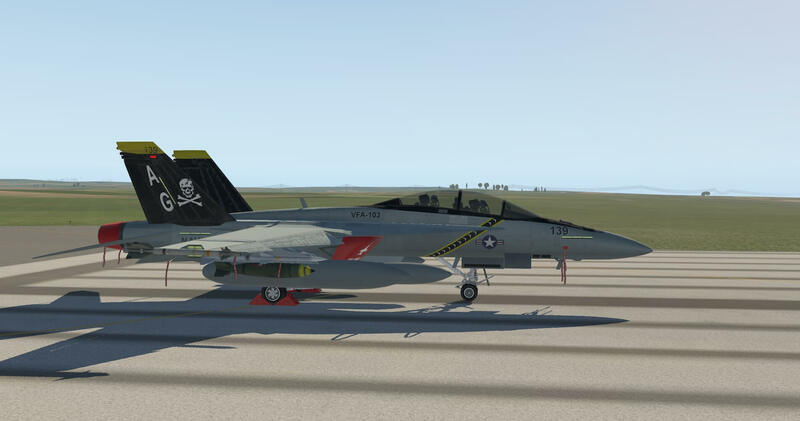 The description on the X-Plane.org website highlights specific qualities and benefits of the model relating to Custom Sound, 3d Cockpit, HUD, Custom Gauges, Liveries, refined Flight Model and a plain and armed version. The model is described as having usable front and rear cockpits and the ability to refuel in the air as well as carrier operations. The model is straight forward to download and completes in a reasonable time. In order to reduce file size and download times further liveries can be obtained separately. The Manuals folder within the aircraft file provides the documentation. Text files gives details of how to contact support, how to update or uninstall the model and where to find Video Tutorials with a PDF advising how to install correctly. A 7 page PDF entitled “Whats New in v1.5” details just that and highlights air to air refuelling, 3d sound, rear cockpit views, head shaker effect on high angles of attack amongst others, as well as detailed labelled screen shots of new switches made available. The final page discusses improvements in the 3D sound and explains many custom sounds have been added, many recorded from the real aircraft, cockpit sound volumes can be adjusted, engine sounds have been made more realistic across all rpm ranges and the BETTY computer voice gives warnings of potentially dangerous situations. The aircraft downloads with sixteen different liveries and a PDF entitled “more liveries” enables the model to be given 41 different colour schemes some in 2k, some in 4k and some in both. The document gives illustrations of some of the liveries and supplies the direct link to the X-Plane.Org (https://x-plane.org/) page to obtain free downloads of others. I found the link worked better when copied and pasted in to the browser search bar but then download is simple and the file can be simply copied into the aircraft liveries folder. The documents include a Quick Start Manual which consists of 33 pages. The document includes a background explanation of the model and its development, a labelled diagram of the exterior a Super Hornet, an description of fly by wire and auto trim, both cockpits and their displays, console switches, night lighting, aircraft start up procedures with a detailed labelled step by step diagram, shutdown procedures, air to air refuelling and a final page dedicated to recognising the men and women using the real aircraft. The final document is the Full Manual consisting of 71 pages. As expected this manual includes all the information in the quick start manual and copies of the other PDFs in the Manuals folder. The manual also gives more detail around how to control cockpit sounds and effects, (cleverly this is done by utilising some redundant dials in the instrumentation itself so all actions are controlled from the cockpit), set up and rendering, AI aircraft, further menus on displays, flight guidance and carrier operations. 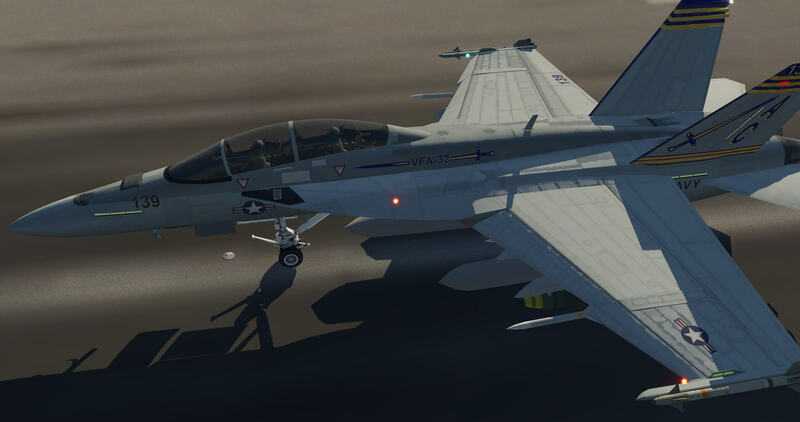 In terms of AI aircraft Colimata provide an armed and unarmed version of the Super Hornet in file form to be installed if required as AI aircraft as using the full version as an AI aircraft on screen will take up too much computing power. This is a full, helpful and comprehensive set of documentation for the model. The X-Plane.org page states that the aircraft can be used by people of different skill levels and these documents go a long way to facilitating that. They are thorough, straight forward and clear, improving understanding of the model and allowing the user to obtain the level of experience they require from the model. Visiting and re-visiting the manual is very worthwhile as the immersion into the realism of the model increases. The documents also convey a real enthusiasm for the model itself and a clear desire for the user to enjoy all aspects of the aircraft. An initial walk round of the aircraft in cold and dark mode shows the level of detail supplied with the model. The panels carry their own weathering and the colours of the liveries are bright and sharp. When seen with the engines off the aircraft steps are connected and engine covers and remove before flight ribbons are in place. Wheel chocks are visible as are the two aircrew figures that move independently and realistically. Opening the canopy reveals these figures and the ejector seats in more detail. All elements of the model are detailed including the armament and the undercarriage whilst the writing on the signs and labels on the aircraft remains clear and legible. Michelin will be very pleased that their make is modelled on the tyres and clearly visible! When viewed with engines running the lights are clear and bright and detail remains high. 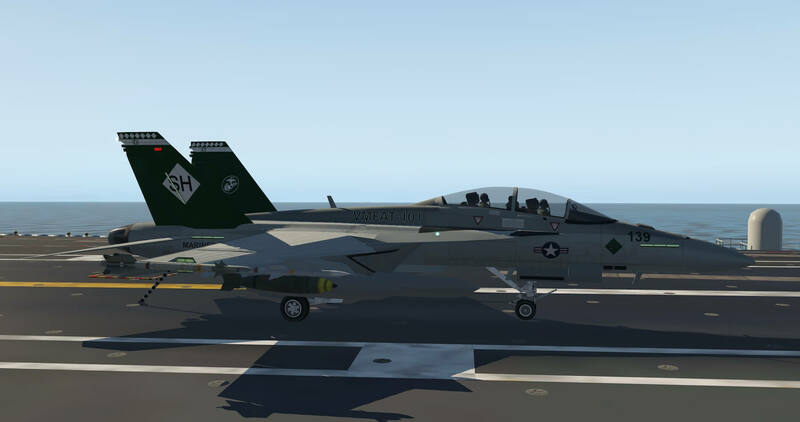 The model fits in to all scenery in X-Plane very well and, as would be expected, looks very much at home on the carrier flight deck amongst other aircraft. In lower light the model maintains its integrity and the display of the aircraft lights is highly impressive, The wings on the aircraft can be folded via switches in the cockpit and the armament responds to the wing folding correctly. I did find that if I paused the simulator and then changed the location the aircraft was loaded as if sunk in to the tarmac, however releasing the pause and then pausing again if necessary, saw the aircraft miraculously grow out of the runway and appear correctly. The model then remained in the correct status. I cannot claim to have flown or worked with the Super Hornet but I was privileged enough to be close up to one whilst the ground crew prepared it for flight and communicated with the pilot. They did this in the same manner as they would on a carrier deck and this was impressive in itself even before the aircraft took off. This model has the same presence as the real thing and Colimata have created such detail, colour and weathering this is a highly realistic representation of the Super Hornet when viewed from the outside. The same attention to detail is apparent in the cockpit and aircraft interior as that shown on the exterior. Both the front and rear cockpits are modelled with the latter having the same display instruments as the front. The front cockpit has the central display (Up Front Control Display), a left and right digital display indicator, digital fuel display, and stand by instruments. There are active switches on both right and left consoles. The rear cockpit has the same displays and the ability to use mirrors to see rearward. Movement between the two cockpits is easily done with a click of the mouse. All dials and instruments are clear whether viewed normally or zoomed in. The interior colours and wear add to the realism. Cockpit lighting can be adjusted via console dials and night lighting can be switched on and lighting levels varied when required. Some lighting requires rendering settings to be set to HDR. 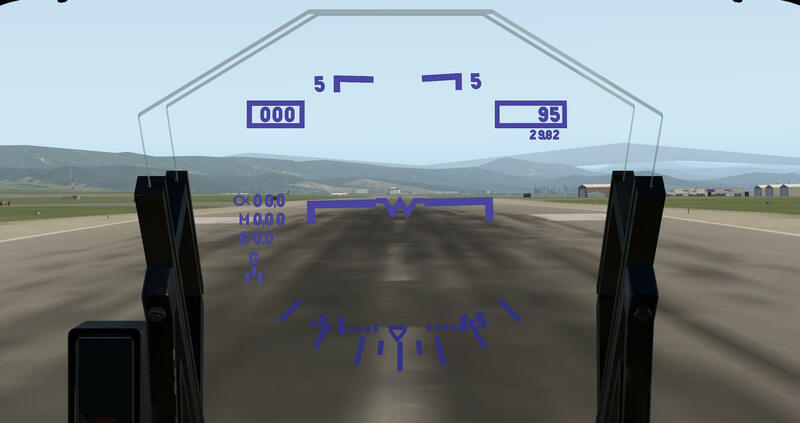 One of the key parts of the model, mentioned in the X-Plane.Org page and sales material is the head up display (HUD). The display is very well modelled and is designed to display the same whatever angle and distance the pilot views it from, as long as this view is true to life. 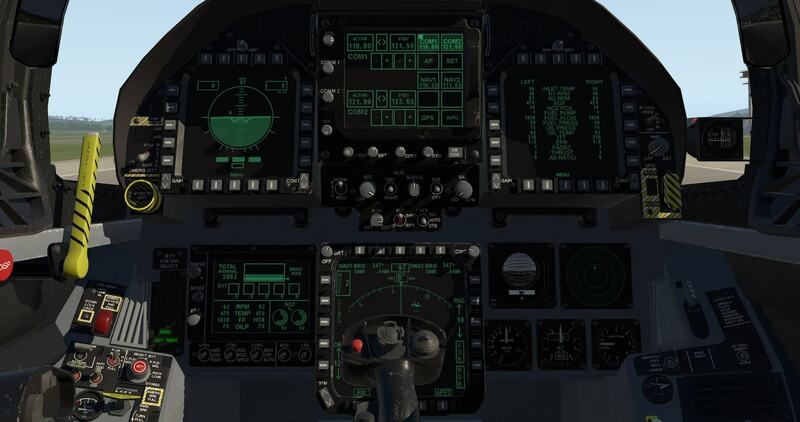 It is possible to use dials in the cockpit to manage HUD brightness, colour and line thickness. The HUD is clear, well defined and very realistic. Whilst the default is a display which many will have seen in aircraft themselves or films, it can be changed to be much bolder and brighter with well defined colours. The display gives information on airspeed, angle of attack, Mach, G, gear. flaps, ILS, pitch, altitude, heading, direction of flight and vertical speed. All values change in real time and are synchronised with the other instruments displaying those values. The amount of information the model is capable of providing through the various displays is very impressive. A menu around the edge of the screens allows the pilot to select the information required from each screen and customise the cockpit in real time to suit the situation. The manual gives detailed advice on how to change the screens and obtain whatever information is required including radar, engines, fuel, attitude direction, flight data, GPS, horizontal situation and weapons. The Up Front Control Display is positioned directly in front of the pilot and provides numerous options itself. The menu is a touch control (via the mouse) and allows changes between Com 1, Com2, Settings , autopilot, Nav1, Nav2, GPS and also adjustments to brightness, volume and Squawk identification. Each setting then has its own set of variations. 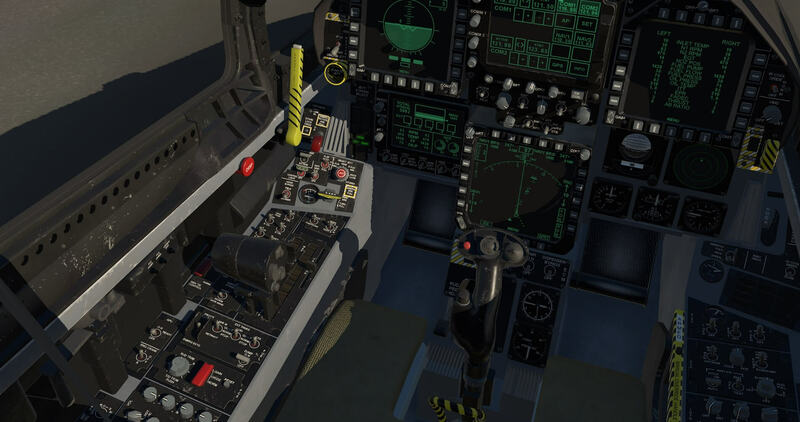 The console switches also allow a large degree of interaction with the right side controlling lighting, canopy, engine generators, tail hook and wing fold, and several more. The left side includes controls for brakes, landing gear, landing lights, trim and refuelling probe. As mentioned earlier several of the modelled switches are not used for their real life actions such as oxygen flow and mike controls but instead allow control of simulator sounds to the cockpit such as head shake, in cockpit engine sounds and cockpit fans. The interior modelling is detailed, comprehensive and thorough. There is clear effort made to make the cockpits as realistic and interactive as possible. They can be used for a very basic level to simply fly up to a fully immersive experience with all correct flight information and systems available. No short cuts or compromises have been made to make this as true to life as it can be. The model is straight forward and easy to load with engines running and simply fly. It is highly responsive and covers the ground at an incredible rate if you let it. 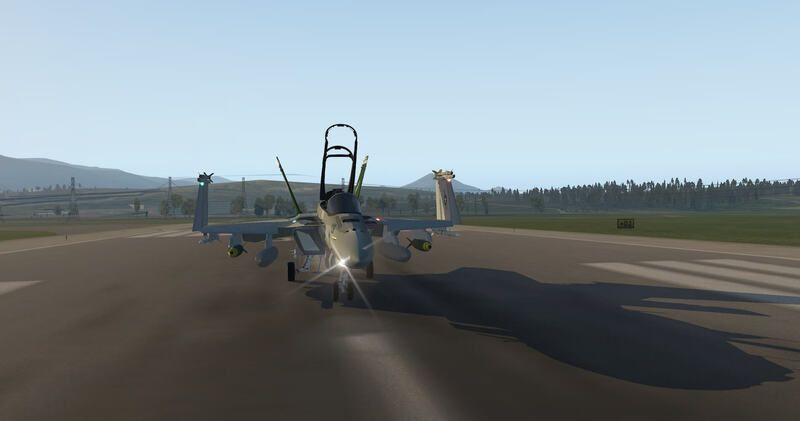 Acceleration is very impressive on full afterburner and its great to see so much X-Plane scenery in one flight. The power of the aircraft does make keeping straight on the runway a challenge but this is overcome with a bit of practice. If you intend to move on to more realistic flying its worth practicing using the HUD during these flights so that it becomes the norm to use it and you know where to look and what information to expect. This model is very realistic and the amount of information can be a bit overwhelming but after a while, and having set up the displays as required, this data becomes useful to creating a realistic flight. The model reacts quickly to any input and therefore the movement of the joystick and rudder control correctly needs to be done with a lighter touch than general aviation aircraft. Flying the aircraft from cold and dark is made more straight forward due to the detail and assistance included in the manual. Pages for this are provided in both the quick start and full manuals with screen shots of the instruments and numbered diagrams to illustrate each step. I followed these instructions and completed the process successfully although I did find that when cranking each engine with the starter switch I needed to slightly exceed the recommended 20% RPM to ensure the engines kept turning. The manuals certainly help to make the experience more realistic even for an inexperienced pilot and means that more of the aspects of the model can be enjoyed. The following page in both manuals gives similar guidance as to how to shut down the engines and aircraft. Just as in the case of startup these instructions are straight forward to follow and I managed the shutdown with few issues other than I held the engine starter switch in place for too long to induce engine shutdown but I soon corrected my own mistakes and completed the process. Again the effort put in to the manual enables pilots of all levels to enjoy a fully immersive experience. The manual also includes guidance for both take off and landing and refers the pilot to the landing speeds chart supplied in the documentation. As there is so much information in the manual I found it useful to be able to refer to it at the same time as learning what to do. This could mean split screen viewing, two screens or the use of another device to display it. Following the guidance is straight forward and the pilot is reminded to keep those control inputs gentle. The aircraft feels under control when carrying out the advice given for take-off and transitions in to very smooth flight. The landing guidance is very useful though carrying out the procedure is quite a challenge even when the instrumentation and “Betty” are giving all the guidance they can. When I was too heavy with the landing X-Plane advised me I had blown a tyre and the model even represented this whilst standing on the runway. The Manual does advise the pilot to be careful with the use of afterburner and true to life over use of the throttle means the line on the fuel gauge drops at quite a rate. Just as well then that Colimata have modelled air to air refuelling. The real life Super Hornet is capable of refuelling from a basket behind a tanker. 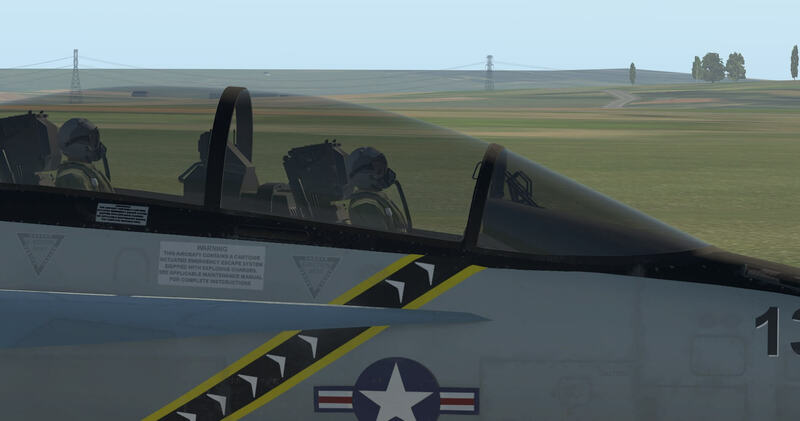 Refuelling in the model can be done through the special starts air to air refuelling but also it can be done during a flight in the main simulator, allowing extended flight time during any flight plan. As soon as the refuelling probe is fully extended, the refuelling starts when the FA-18F is at a distance of less than 330ft (100m) to another aircraft and vertical distance less than 100ft (30m). It’s therefore your decision in how realistic you want the refuelling process to be. Depending on the point in time you toggle the refuelling probe. The manual is correct that the refuelling process is difficult but it is an enjoyable challenge. As long as the simulator has an AI aircraft loaded the model can fly to within the parameters outlined in the manual and refuel. 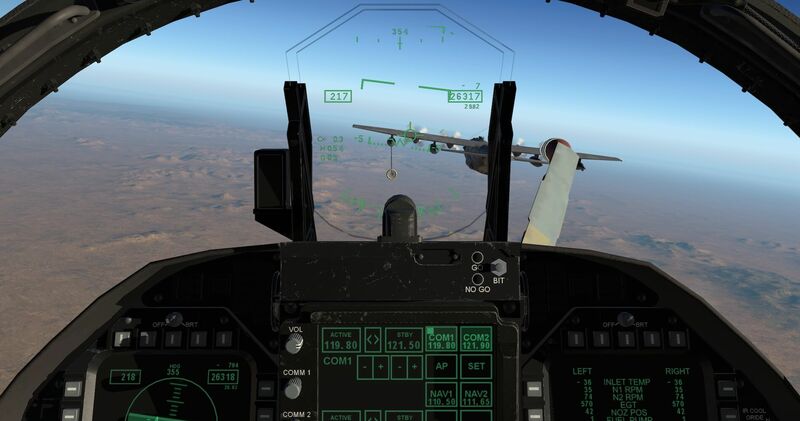 I used the KC-10 Extender aircraft as the AI aircraft and whilst this has a refuelling boom not a basket it made the experience very realistic and enabled me to continue flights that would otherwise have ended up in a very different way. I found it useful to use the fuel screen on one of the DDIs to confirm the aircraft was taking fuel as it is easier to see than looking further down at the fuel gauge, Refuelling takes place at a high rate and therefore holding position to complete is made slightly less challenging. There is clearly no way to radio for a refuelling RV within the simulator in a normal flight but the AI aircraft are always fairly nearby. They can be located by using the map view and then followed or they can be dragged and dropped to create position and their altitude and speed set through the map view itself. In any of these cases the refuelling adds another dimension to the flight, has been made easy to create and extends the use of the model. The longer the pilot waits to extend the fuel probe the more accurate the flight has to be to initiate fuel flow. The only issue I had was that I has to look down away from flying to find the probe switch and if I was not careful this could distract me from my approach to the tanker. More practice required I think. The manual moves on to guidance for carrier operations, both take off and landing. The instructions are very clear and enable a realistic experience, though certainly not as risky as the real thing! Take off is straight forward in the sense that most of it is done for you but there is still a feeling of acceleration as the simulator takes you off the deck. Things happened so quickly that it took me a few attempts to then go back to the carrier as my own situational awareness could not cope. Landing on the carrier is hugely challenging but enjoyable. I almost had sensory overload as numerous pieces of information, both audible and visual, told me where I was going wrong and I tried to follow the ILS indicators in the HUD. This is not something that just happens and takes practice to achieve but creates a great sense of achievement. 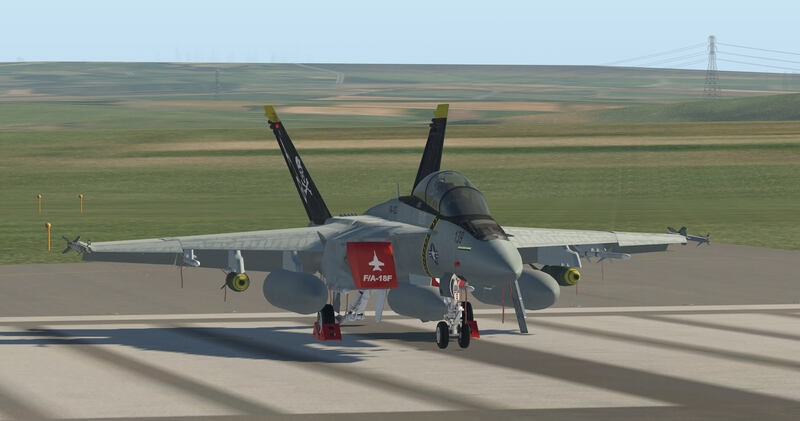 The manual has a page dedicated to those who fly the Super Hornet in real life and the simulated deck landing really demonstrates why we should respect them so much. Through patience, practice and prioritising the information from the various systems a successful landing is possible although the ones I am managing need some refinement. Colimata are very supportive in their guidance reminding us not to be frustrated if we do not succeed at first. The aircraft has many systems available to the pilot in terms of the displays mentioned earlier. They are easy to navigate, change and customise to create the front and rear cockpits required. The settings menu option in the Up Front Central Display is not the settings for the simulator but settings for the aircraft systems such as the transponder, barometer and radar altimeter. The auto pilot is different from those in general aviation aircraft with slightly different terminology, but again the manual gives considerable assistance in its understanding and use. Having made several flights to use the auto pilot it all becomes straight forward and logical and makes flying over distance easier. It is easy to input adjustments and control heading, speed, pitch, roll and attitude and the aircraft responds quickly and smoothly. The auto pilot screen also contains a GPS button which then leads to an X-Plane GNS530 screen. Whilst flight plans can be loaded as normal, the auto pilot is not directly coupled with GPS so navigation to way points has to be done by manual inputs into the autopilot heading settings. Colimata explained to me that this is set in this manner as it is the most reliable way for an aircraft such as the FA-18F, that can fly incredibly fast but also extremely slow. The developers know that using the autopilot is popular and are working on a way to develop the this further. I did not find this diminished use of the autopilot it simply meant a little more attention had to be paid to headings. The GPS is still very useful for navigation and the flight plan remains easy to follow. The weapons system relates to two DDI screens which I found were best displayed in the top DDI screens. The radar screen gives a view of aircraft in the vicinity and identify friend or foe once the weapons systems are set to armed, as displayed in the weapons DDI. The simulator has to be set with AI aircraft, combat enabled and at least one AI aircraft shown as enemy. The ability of the enemy can also be altered. Once the range of the radar is set it identifies enemy aircraft in red and highlights the target aircraft. Radar range and the chosen target can be altered by buttons on the edge of the display. Once a target is chosen and locked the weapons DDI enables the selected weapon to be highlighted and fired. The weapons display DDI shows all weapons available and is easily used to change to a suitable weapon for the circumstances. Whilst the systems do most things for the pilot there is still a lot of information to assimilate and, of course, still an aircraft to fly. The systems work well and are easy to use after a little practice adding a whole different dimension to a flight. Combat is not always successful and remember the longer it takes to deal with the enemy the lower that fuel gauge is going. The sounds within the model are another aspect highlighted in the X-Plane.Org page. The quality and realism of sound is very high and as much attention to detail has been paid to the audible presentation of the model as it has to the visual aspects outlined earlier. With so many activities taking place some sounds are very useful in terms of dealing with an issue without seeking visual confirmation, for example the clicking sound which occurs when moving the throttle in and out of afterburners. The voice of “Betty” gives appropriate information at appropriate times and greatly assists the pilot. The quality of the 3D sound adds to the whole flight experience. 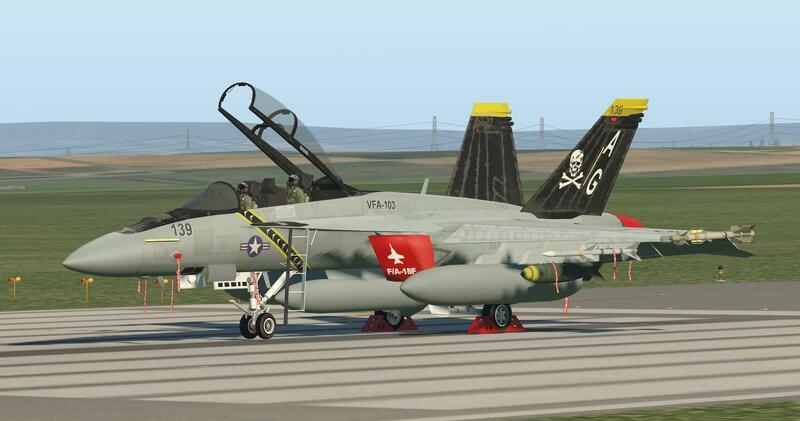 Detail both outside and inside the aircraft is very good and this is augmented by the realistic custom sounds. 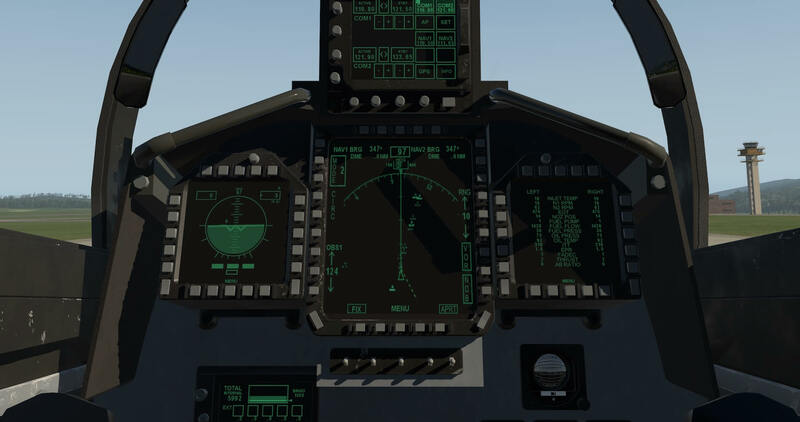 The 3D cockpit is full of realistic gauges, switches and displays giving the model a high level of capability. The large number of liveries supplied allow multiple variants to be flown in both armed and unarmed configuration. The flight experience is varied and can be viewed from both front and rear cockpits and the included challenges of in flight refuelling and carrier operations are very well produced. This model is a totally immersive experience where the boundaries of challenge and realism can be constantly extended. Given the nature and capabilities of the aircraft a straight forward flight is a great experience and enables the pilot to use the X-Plane environment to the full. 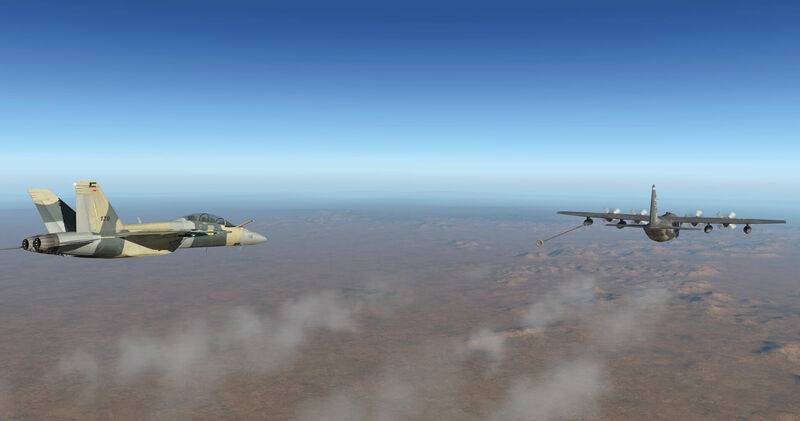 As the simulation is used in a more and more realistic fashion the challenges grow and the capabilities, detail and variants of the aircraft can be appreciated more and more. There is a real enthusiasm from the developers to make this a thoroughly enjoyable and highly capable model. The manuals supplied are a great help and lead an inexperienced pilot through the many processes and activities which the model is capable of delivering. Whilst each individual activity within the model can be achieved after practice, and whilst it can be used at all levels, there is always a feeling that there is another activity to be mastered or those activities carried out could be achieved at a higher level by the pilot. A thoroughly enjoyable, immersive and highly detailed model which will keep pilots of all experience and skill levels occupied for a long time. For more information visit the dedicated X-Plane.Org web page. As of this writing, end of October 2017, the FA18-F Super Hornet cost you 29.95 USD. Yes, this ac is very immersive in relation to strange ac behaviour. I commented this on x-plane.org in the Colimata F18 forum. I can not recommend this ac at this stage of development because it makes me feel like a beta tester. Sorry, can say it friendlier. Why does the engine sound stay at ground idle (62%) after shutting down? After shutting down, you can hear the spooling down of each F414-GE-400’s but then the ground idle sound still lingers for a few seconds and abruptly shuts off. That’s not how the real Hornet and Super Hornet engines shut down. They would spool down as soon as the pilot shuts down the engines. They got the engine sounds right and near perfect, however, and I applaud them for the effort into implementing this into the sim. I would know this because I used to work on F/A-18C’s (“Legacy” Hornets) as a jet engine mechanic in the US Navy and the engine sounds are spot on from spooling up at rpms as well as spooling down back to ground idle. If only they got the engine shut down sound right, the jet would be near perfect (for the most part anyways when it comes to sound). 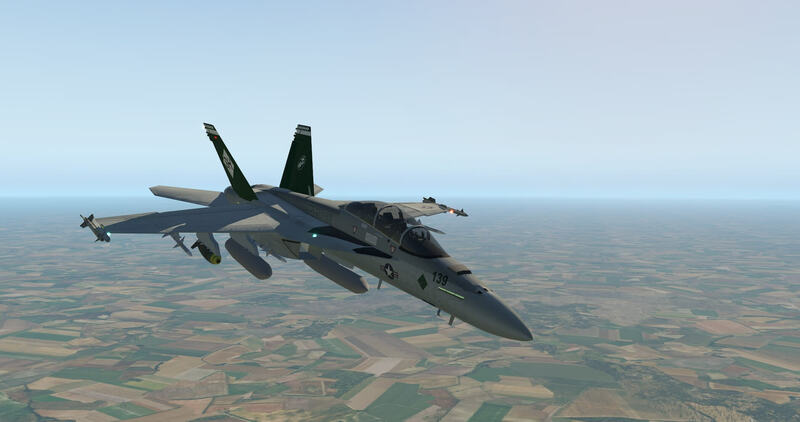 When I load the f-18 v1.51, I get a clicking sound, as if I am throwing a switch. I can’t find the source. It appears to be continuous. It does not happen in the earlier version.